Wet tissues, also known as 'wet towels' and 'moist towelette', serve the purpose of removing sweat and dust off your face. They are simple and convenient product to dispose of dirt or undesirable elements to maintain cleanliness and hygiene standards. We produce wet tissue papers by using sterling soft tissue at high temperature to protect you from infection and other bacterial disease. These wipes are gentle on skin and removes sweat that is present in the pores of your skin giving you radiant and refreshing look. Our product contains sweet fragrance leaving you fresh and confident. We also offer pocket pack facial tissue papers to our customers produced using the top quality raw materials. 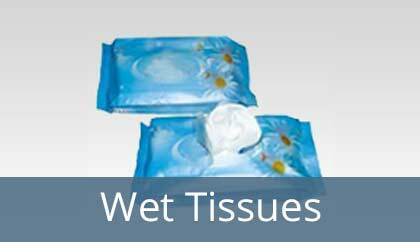 Wet tissues are produced considering personal hygiene of an individual in daily life. It is widely used in Hospitals, Hotels & Hospitality, Fashion and Glamour Industry. In the absence of a soap or a face wash, wet wipes acts as the best alternative to make you feel refreshing.